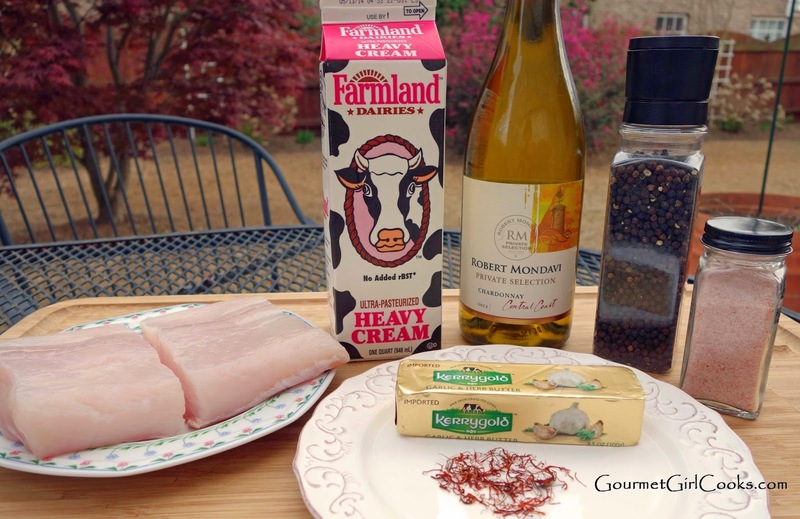 This evening I decided to prepare the fresh wild Pacific halibut we picked up at Costco today. It was a beautiful fillet that was slightly over 1 pound. I cut it in half to make 2 large fillets. 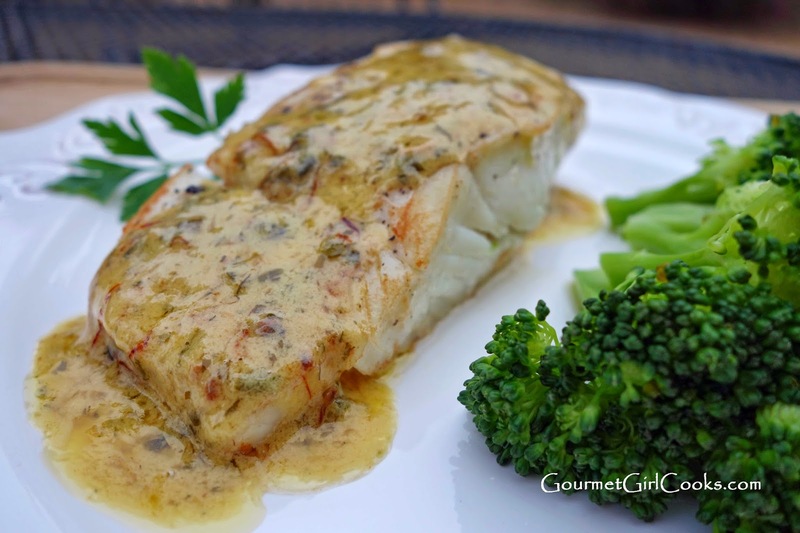 I absolutely love halibut. It is a mild, meaty fish and when cooked to perfection, it flakes into large flakes and is ever so opaque in the center. The texture sort of reminds me of a big sea scallop that is cooked just until opaque. I like to pan sear my halibut because it cooks very quickly, about 3 to 4 minutes per side, depending on the thickness of the fillet. These were pretty thick so I cooked them about 4 minutes per side. One of my coworkers recently brought me some saffron threads. While I have eaten saffron rice before, I have never actually used it in cooking As many of you probably know, saffron is an expensive spice. Saffron is actually fine threads that are stigmas from the crocus flower (I always thought it was the stamens of crocus flowers, but in my research of flower anatomy, I found out that stigmas are the male part of the flower and stamens are the female parts...who knew?). It's known to be one of the most expensive spices in the world and it takes about 4,500 crocus flowers to produce 1 ounce of saffron. No wonder why it's so expensive! If you are interested in finding out more about saffron, here is a link to Dr. Mercola's interesting "food facts" regarding it: Saffron. Hubby and I thoroughly enjoyed this meal. I'm glad that I still have enough saffron left to make several other dishes with as well (a little goes a long way). 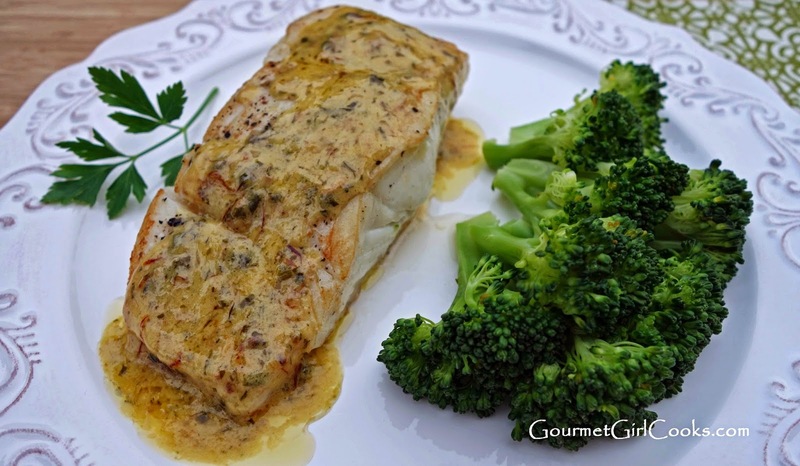 Now, I would be totally remiss if I didn't let you know that as I prepared our Pan Seared Wild Pacific Halibut with Saffron Cream Sauce...I found myself singing the song "Mellow Yellow". You might recall that it goes something like "I'm just mad about Saffron...Saffron's mad about me...They call me Mellow Yellow (quite rightly)". 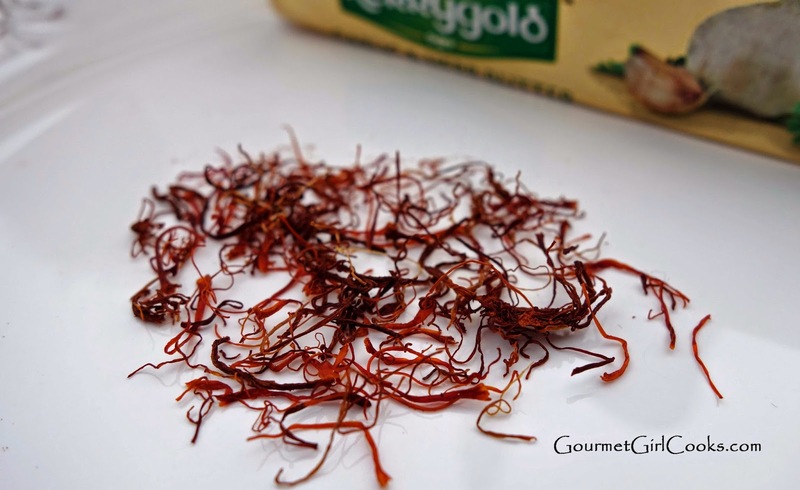 If you happen to come across saffron, this dish is worth trying -- you don't need to buy a very large quantity because a little goes a long way and the little threads are quite light (as in not heavy) so they don't weigh much. 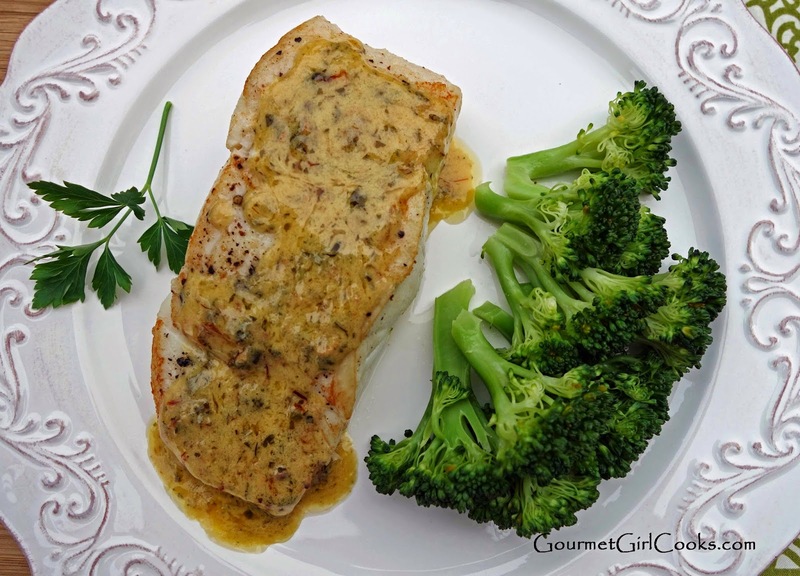 I served our halibut alongside steamed fresh broccoli. It was a quick and delicious meal that tasted like a restaurant quality meal. I snapped a few photos as well as the recipe below. Enjoy! Season halibut with salt and pepper on both sides. Melt 1 tablespoon butter with 1 tablespoon olive oil in a 10-inch nonstick skillet over medium-high heat. Add the fish and saute about 3 to 4 minutes per side, depending on thickness of fillets, until light golden brown. 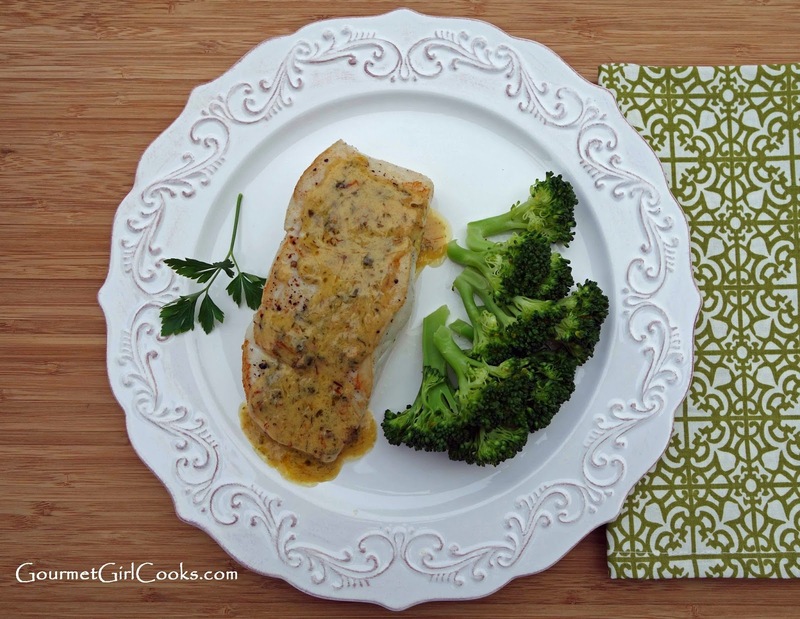 Transfer to a plate and cover with foil to keep warm. 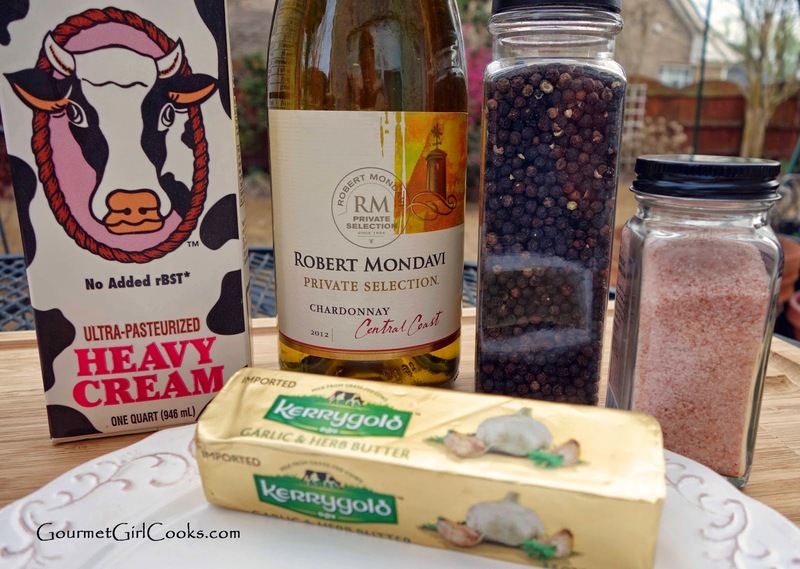 Add the wine to the hot skillet and simmer until reduced by half, about 5 minutes. Add 2 tablespoons garlic herb butter and swirl until melted. Add cream and saffron threads and simmer, stirring frequently until sauce begins to thicken slightly, about 3 minutes. Season sauce with salt and pepper, to taste. Serve fish with sauce spooned over. 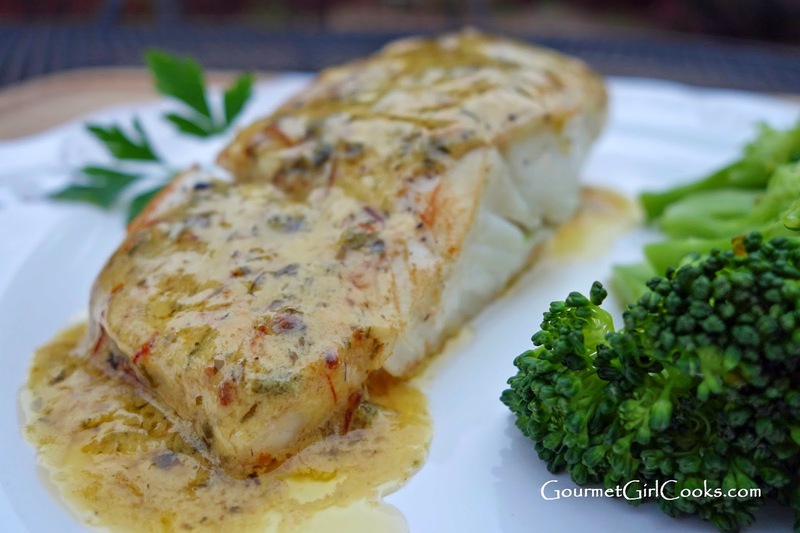 *Note: If garlic herb butter is not available, substitute 2 tablespoons plain butter, 1 teaspoon finely minced parsley and 1 minced and sauteed clove of garlic. I am in love with your white dinnerware-is it a pattern that is available somewhere? Thanks so much for the link--I am so rural-but there is a pier 1 50 miles away-and I get to the big city every couple of months! I will be checking it out! I could easily have an addiction if I had the room! I dream of a butler's pantry!